Guide to naming comic characters in the '90s: pick a random word that has nothing to do with their powers. We're lucky they didn't spell it "Skreme." 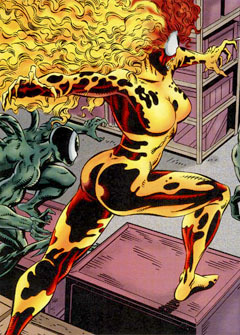 A former security guard, Donna Diego is merged with components of the Venom symbiote and becomes the tendriled villain, Scream. Scream comes from the same storyline that brought us Lasher, and so has the same origin: a group looking to create superpowered employees decided to milk Venom to create more symbiotes, which is pretty much what Marvel itself was trying to do - metatextual, much? 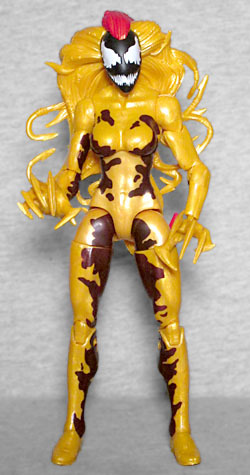 She got an action figure from ToyBiz in 1996, where the bio claimed that she was mentally deranged before being bonded to the suit, and sought to destroy all other symbiotes because she believed they were evil. That apparently comes from the Venom: Separation Anxiety miniseries, where she was framing Eddie Brock for the murders. For the rest of us, though, she's basically just "yellow girl-Venom." Since Scream and the other baby-Venoms were created after Carnage, they share a lot of his looks. Four of the five of them had his sort of built-in fangy mouth, and they all had dark faces with jagged white eyes. Some of the art made it clear that Scream's head was actually red, not black, but this toy sticks with the more familiar "Oreo cookie" look. All the symbiotes created by the Life Foundation had a different specific power (in that they were all using the same power - ie, the symbiote - differently). 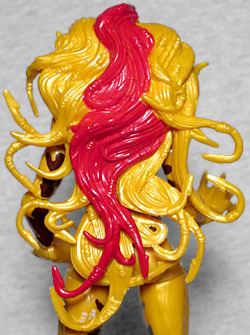 So while Lasher had those back-tentacles, Scream used her suit to animate her hair. Yes, seriously. She basically did the same thing Medusa does, though her hair isn't as long and she tends to turn the ends into spiked hooks for extra hurting. Since that's a pretty unique fighting technique (and her hair wasn't as long as Medusa's), the hair is a new mold. Several new molds all glued together, actually. Very complex! Scream is built on the "thicc" body, possibly because that was the only one with arms big enough to look right using Carnage's clawed hands. Her hair is so big that the body seems pretty small by comparison. Unfortunately, the paint applied to that body isn't great. 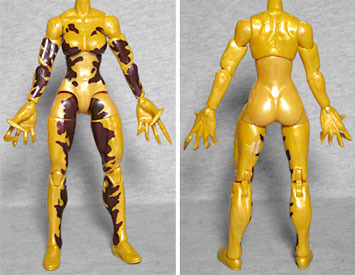 She's molded from a slightly metallic yellow, which means there's a little bit of swirlishness to her coloration (which actually works a lot better on a symbiote than it did on, say, Iron Monger, because of the depth it creates), and then painted with brown splotches. Two problems: one, they're supposed to be red, like her hair, not brown; and two, they should be all the way around the body, not just one the front. Turn her around, and she's pretty much plain yellow. Since when does Hasbro want us to keep their figures MOC? Scream comes with a piece of this series' "Monster Venom" Build-A-Figure: the right arm. Which is nearly the same size as Scream herself. Now that we have Scream and Lasher, it'll be interesting to see if Hasbro manages to put out the other three members of the group. If nothing else, it would let them reuse this female symbiote head - once they glue some new hair on it, of course.